We are a network of locally-born-and-raised guides. We know our home cities as only a native would – the landmarks and the heritage, but also the side streets, the secret spots and the good gossip. We started Discover Walks in Paris, in 2010, to give visitors a couple of special hours walking around Paris with a real native – the Paris a tourist would never be able to find alone, the kind of experience you would have only in the company of a good and knowledgeable friend – fun, informative and most of all, personal to you and your guide. The idea has taken hold with tourists with over 50,000 of them joining our tours in two seasons – and we expanded to San Francisco. And now to cities across Europe as well. Best prices – our goal is to give high value for the cost of our tours. We offer both a ‘free,’ tips-only service – you decide how much the tour is worth after enjoying it, as well as more traditional ‘fixed fee’ tours, experiences, and events. Today we are delighted our tours are being recognized as innovative, precious and fun by the media and tourism professionals, with numerous awards and recognitions to boot. Most important to us, our guests recommend us to their friends and relatives, and follow us on multiple tours in multiple cities. Our guides are called City Guides. Their job is to know their city better than an English cabbie knows London. We do extensive training and conduct written and oral tests. Everywhere our English needs to be understandable to visitors from Australia or Argentina or the USA or Japan – as Discover Walks guests come from everywhere. Our City Guides add their personal stories to every walk, from what it’s like to study in the local school to the restaurant they went to on their first date. Thus each Walk includes famous local landmarks as well as unique times when each guest “feels like a native”. Our Core Walks are all free of charge – you give what you think is right for what you get. You’re always welcome to join us, without advanced booking – our Walks start and end at major city landmarks. Our original founders Alexandre Gourevitch (Paris native) and Jim Jorgensen (a Californian) represent the two spectrums of each Walk – the local and the guest. Today, our City Guides take great pride in constantly improving each Walk. We are especially thankful to our founding staff Bertrand, Charlotte, Cécile and petit Victor, for sticking with us at the beginning. Discover Walks is a trademark of our owner Charing Cross Corporation (our lawyers made us put this in.) Discover Walks is operated by Discover Walks LLC. We are insured by CNA Insurance Company Limited’s sub/succursale at 37 rue de Liège F 75008 Paris France. We walk rain or shine. Each time, on each tour, we hope to turn your vacation into a celebration. 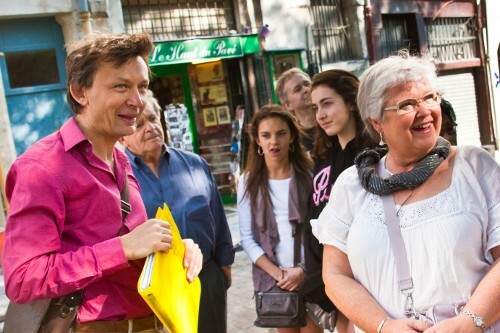 Paris walking tours by Discover Walks is the best way to experience Paris, with its local flavor.